Here's proof that it can be done. If every visitor who found your website through a search engine like Google bought a picture, then you would not need a lot of visitors. Unfortunately, this is not often reality. You need many visitors who then also make multiple visits. But how many? This is a difficult question and one without a conclusive answer. However, common sense, research and interviewing professional marketing people can give us an estimate. I showed my website (www.janke.be) to them and proudly told them that I have 1000 unique visitors per month, that I use it for photos to be delivered to existing customers, and furthermore would like to make sales to new customers through this website. I thought I would be advised to make some changes to my website so I would generate sales from the 1000 unique visitors each month. However I was to be greatly disappointed.. I was told that a site of “only” 1000 unique visitors per month has no chance of selling to new customers but that in contrast, a website with 30,000 unique visitors generates an average 472 sales per month. The probability of making a sale on your site increases with an increase in the number of unique visitors. Increasing the amount of visitors does not proceed linearly, but in stages - sales gradually rise when a website reaches 10,000 visitors and then increases at a more significant rate. In more detail, up to 10,000 visitors, the chance of making sales increases from 0.1% to 0.3% but after this point increases from 0.3% to 0.8%. So among the 10,000 visitors, you may have 30 sales per month and suddenly you may have 80. The next jump you see is at 15,000, 20,000, and every further 5000 . I found this very disappointing because I realized that I would never generate more than 2000 visitors per month, and certainly not 10,000 to 30,000 or more. As many artists and photographers, I did not have the time to do the required optimization for my website so that visitors would buy from it. The marketing team asked me to test a package of Search Engine Optimization (SEO) techniques on a separate simple website. This site would be promoted via the same package to which you can subscribe. (Only for selected photographers, when not selected yet click here.) To maintain the test website I did not have to work on it daily, but only occasionally. I was just required to carry out some maintenance through publishing some articles on it, which they gave me as an example. I published the "test" website in the last week of May 2011. The statistics showed the site had 18 unique visitors that week. From then, every two weeks I posted a short text with a link to the site in the package, which was a minimal amount of work. The marketing team did the rest. Each month I visited the statistics of the site and saw a slow increase in the number of unique visitors; and suddenly, eight months later - the system takes patience - in the first week of January 2012 there were more than 2000 unique visitors. So this month I predict between 5000 and 10,000 unique visitors. From 18 visitors to 2000/week eight months later! My initial disappointment has turned into an enormous satisfaction. To prove that the system works, you can see it yourself via the links below to the statistics of the site. 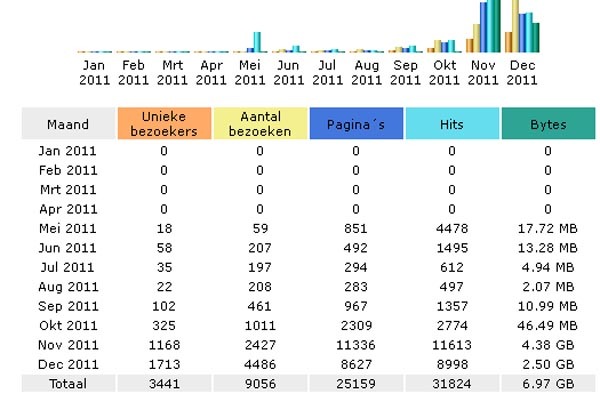 My apologies for it being in Dutch, but the numbers speak for themselves. Below you see screenshots (1/16/2012) of the statistics.. Here are some translations from Dutch to English to help. It can be clearly seen that in the first few months progression was slow. However, suddenly the number of visitors rocketed. In conclusion, to have over 10,000 unique visitors per month is very possible. All you need to do is maintain your website, regularly post new pictures with accompanying text, I will pass it to the SEO package and have some patience. What do I mean by patience? The first results can be seen after 4 months. (in the statistics you can see a jump from 22 to 102 visitors) and a big jump after 6 months (from 325 to 1168). More than 10,000 visitors will be achieved after 12 months and a page 1 position is realistic in 18 months. It takes time and it takes some money, but if you never start, you will never see results and your competition will have has started. 1) You must already have a website to sell your work. You then regularly publish your new pictures on your website with a brief description (a sentence roughly the size of a Twitter message). Also, you must ensure that your pictures are priced. Additionally, have an "about" page properly completed. In short, the things you know. 2) You join the group with a subscription. (You can read about it and buy a subscription here) . Only for selected photographers, when not selected yet click here. 3) If you want total or partial control of the texts that will be published about you and your pictures, you can do this only when you write your own texts and submit them via the forms on this website. 4) You can also choose to write no texts at all and do nothing. Let the SEO people do the rest. Mind you, we buy this as a group and they treat us as if we are a single customer. Common between us is that we are all photographers and are selected based on quality and originality of our work. The texts that SEO people write are relevant to our work and positively written. However, it is impossible to separate all their texts in advance to check for consideration. This is the disadvantage of doing something in a group. The advantage is of course the lower price paid by all of us. There are 20 texts per month about your work published in the SEO package. You can write some texts yourself and let the SEO firm do the other. For example, if you have 5 texts of your own, these will be published and 15 others follow. If you do not write the texts yourself, then they publish 20 of theirs. You write 12 articles, they write eight others and so on. So there are always 20 texts published. The limit is 20 because everything has to look natural. So the texts are published at irregular intervals. This generates the desired response from the search engines. A subscription costs 30$ per month, terminable each month, and you can always re-subscribe. You must decide yourself if it looks interesting. Look at how many visitors you have now, and how much pictures you sell to them. Calculate how much more you can earn by selling to, for example,10,000 or 30,000 visitors per month. You should always aim for the goal of more sales. That is what counts. Remember: You can always do your own SEO, it costs no money but time. Lots of time. This entry was posted on Wednesday, January 18th, 2012 at 7:05 pm. It is filed under Blog. You can follow any responses to this entry through the RSS 2.0 feed.